But nothing sends men hightailing it in the opposite direction quite like relationship I have with my Prius. Mind you, it’s nothing like the guy on My Strange Addiction who frequently goes to 3rd base with Chase, his 1998 Monte Carlo. PS…there’s a woman on that show who is addicted to eating the stuffing in her sofa cushions. She’s already consumed seven couches and two chairs. How can there be people eating sofas out there but no one gets my scratchaphobia? But scratchaphobic I am. I lose sleep over scratches. Literally. And not in the way Rachel Zoe uses the word “literally.” I mean, I actually lose sleep sometimes. And here’s where the beauty of OCD comes in. I’m not freaked out by little dents and dings. And not even by one big, uniform scratch. And if you lived with me, you could leave your socks on the floor and squeeze the toothpaste any old way you wanted. But those little scratches that come with the wear and tear of almost every metal and non-metal object in one’s life…those keep me up at night. And let me fill you in on a little secret. A gun metal grey Toyota Prius with its environmentally friendly paint and low front end is a friggin’ nightmare for a scratchaphobe. Who knew? So when I hit a deer last month driving across the back roads of Texas, you can imagine my horror. You should know…the only thing I love more than my car (besides, of course, my family and friends) is animals…deer being at the top of the list. I mean, what’s NOT to love about deer? Who wasn’t scarred as a child by the death of Bambi’s mother, right? So when I managed to take out both the deer and the Prius in the same moment…well…have you ever seen a melted Barbie? That’s what my face looked like. Except for the Barbie part. The accident happened late on a Sunday night and I was sitting outside Terex Auto Body by 7:30 the next morning. I’d scoped out Terex a few months earlier when I moved to Austin and was looking forward to doing my T-Rex/Matthew McConaughey impression the first time I went in for a polish. But, this morning, I was in no mood for impressions. And besides…Terex, I discovered…isn’t even pronounced like T-Rex. If you’ve ever been to Terex, then you know Rex (He puts the Rex in Terex) and Dan. Between my intermittent bouts of weeping, Dan went over every inch of the car with me and promised to make it look exactly as it had before the accident. When I rolled out my list of rules for driving, entering, exiting, parking, and washing the Prius…which is roughly the length of a CVS receipt…he didn’t bat an eye. Or make a move to call Austin MHMR. He said I actually wasn’t the most high maintenance person ever to come into Terex. Wait—Whaaa? But it gets better. The next day, I came in to finish up some insurance paperwork. And asked 127 more questions. Dan never seemed irritated or in a hurry. Instead, he answered all my questions and went through each step of the repair process in great detail. He even showed me some other cars Terex was working on and taught me some things I didn’t know. Did you know the black moulding mounted along the tire wells is called hips? That’s the “street” lingo, at least. This is a man (and company) who loves cars, loves his work, and loves people. In fact, when I pointed to a part UNDER the hood, a piece that had been scratched for some time and that I wanted to paint, he jumped at the chance. Most people would have looked at me like I had two heads. “You want to paint the cover to your Hybrid Synergy Drive?! ?” But Dan said he always wanted to do something like that and that next time I should come pick out a custom color from his paint book. On top of everything, Terex is re-polishing the paint before I take it in to have the special 3M film I had covering the front re-installed. And then they are going to reapply the license plate and Toyota/hybrid logos after that. They love me. Oh, and Rex? Every time I called during the repair process (which was often), he sounded genuinely happy to hear from me. Who ARE these people? I can’t say enough about Terex Auto Body. I…can’t…say…enough. 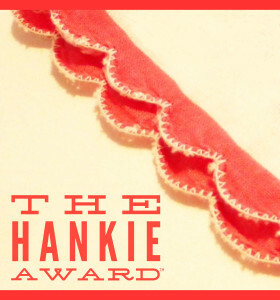 And it’s why I am awarding them with the Lip Schtick & Liner’s Hankie Award…for service so good it made me cry. You’ve ruined me for all others.